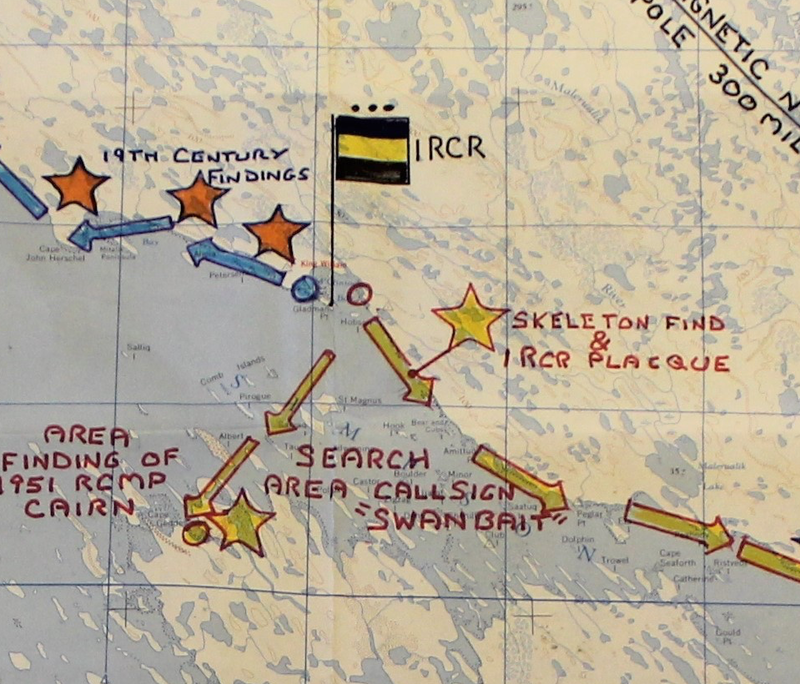 Although it was conduced by the famed Royal Canadian Regiment, and in many ways was among the most elaborately-planned and ambitious of Franklin searches, few people today know much about what was known as "Operation Northern Quest," which took place in 1973. A few footnotes here and there, along with a long-forgotten feature article in (of all places) Canadian Motorist magazine, were all that were publicly known about it. Now, with the help of the Regimental museum, I'm finally able to share with readers of this blog some details of the operation, which included the identification and removal of skeletal remains of a member of Franklin's expedition. 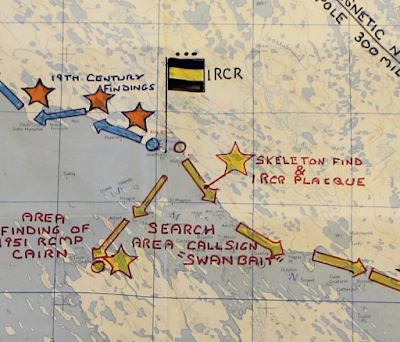 According to an article in Pro Patria, the regiment's official journal, the aim of ONQ was two-fold: "first, to practice skills valuable for the infanteer in the harsh environment of the Far North" and secondly "to uncover useful information about the fate of the Sir John Franklin expedition." That it undoubtedly did, including a nearly-complete skeleton discovered by Corporal Dave Willard "while taking a break only five miles from our firm base." The finds were all mapped, but unfortunately the map -- a detail of which is shown here -- does not say anything about what was found, with the exception of the skeleton. Stars simply mark "19th Century Findings." including one tantalizingly located at the back of Terror Bay. All the findings were to be deposited at the Museum of Man, but unfortunately the Canadian Museum of History -- today's successor to that institution -- has no records of them. [We] found bones protruding from the ground by a large rock. A quick check showed this to be the bones of a large man; too large for an Eskimo. We uncovered as much of the skeleton as we could without unduly disturbing things. We planned on returning tomorrow morning with the metal detector and shovel. Eddy said he knew where a sheet of plywood could be located on the beach to put the bones on. The skeleton had been covered by several inches of moss and rocks. The skull was not visible to us but the jawbone was there. It was not, needless to say, a careful archaeological procedure -- but the bones were gathered up on the plank, and brought back to the Museum of Man. The estimated height of the individual, from the bones, was six feet, and horn and bone buttons were found with it, the combination of which is consistent with the Franklin period (according to the Bertulli report on NgLj-2, four-holed black bone buttons were fading from use in the 1840's; vegetable ivory bones were just being introduced then). 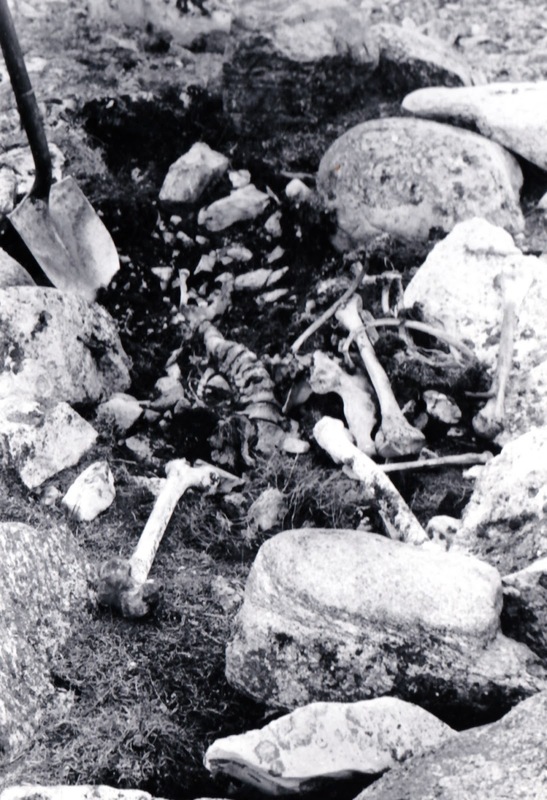 The men jovially nicknamed the skeleton "Joe," and searched about for a other artifacts, but found none. It's also noteworthy that the skeleton appears to have been placed in a sort of stone-lined grave, which would make it the furthest-south full burial managed by the survivors of Franklin's crews. Outposts were established at Terror Bay and Douglas Bay -- two known sites of Franklin-era remains -- and apparently items were found at both; the reports unfortunately don't seem to include a listing of what was found where. One find was described as "a badly disintegrated ship's rudder held together by wooden pegs" -- how intriguing that is, and how much more it could tell us if its exact location were known. Might it have been at Terror Bay? Did the party at Douglas Bay disturb the pile of skulls reburied there by "Paddy" Gibson, and might that be why they were missing when Owen Beattie and Jim Savelle went looking for them in 1981? I'm hopeful that publicizing this expedition might lead, as it has in other cases, to more information from persons who participated in it, or their friends of families. If any such are reading this, I would be very happy indeed to hear from them. When did Operation Northern Quest take place? I don't think you're article mentions it. Sorry, it's 1973. I'll update the text. Thank you for this informative account of Operation Northern Quest. We have prompted our social media followers about it https://www.facebook.com/RCRMuseum/ Members of the Op Northern Quest are currently volunteering at The Royal Canadian Regiment Museum. That's great news -- I would be very happy to hear from them or anyone with further knowledge of this operation. From the photograph, this looks like a quite substantial grave, involving a lot of labour to construct. (probably for a non officer ?). If this grave is not the result of a later re-burial one wonders why this grave was indeed so far from the ships while lots of other remains to the west of it were unburied/vbarely buried. would this support the 1848 hunting expedition hypothesis ? This tomb could the be from 1848 and other unburied (and cannibalised) remains from a later abandonment of the ship(s) with the crew in even worse condition ?